The PlayStation 4 will have a "supercharged PC architecture" and new features that will make it easier to stream games and share content over social networks. The $399 PS4 will start shipping Friday in the U.S. and Canada, with release in various other countries through December and it will be available in Japan in February. 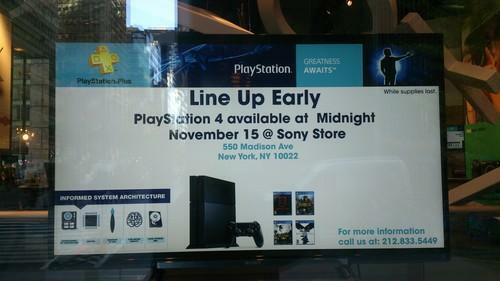 Sony's flagship store on Madison Avenue in New York was displaying signs Wednesday welcoming customers to line up. Advance orders have been strong, Sony said. Sony tried to simplify the hardware architecture of the PS4 to reduce the cost of the console, while future-proofing it to last as long as 10 years, said Dominic Mallinson, vice president of research and development of Sony Computer Entertainment America, in a webcast keynote speech Wednesday at AMD's Developer Summit in San Jose, California. The PS4 has eight x86 CPUs code-named Jaguar made by Advanced Micro Devices. In addition, "enhanced" graphics coprocessors, also made by AMD, can deliver 1.84 teraflops of performance. The game console has a 500GB hard drive with support for Blu-ray. It has 8GB of GDDR5 memory, which is high-bandwidth RAM typically used on graphics cards. More memory was demanded by game developers, so 176 gigabytes per second of bandwidth feeds the throughput, Mallinson said. There are specialized audio and video chips, and other "fine-grained" hardware features that will take time for developers to master, Mallinson said. Sony has designed PS4 for a 10-year lifecycle, which is enough time for developers to understand and exploit the available hardware, Mallinson said. Sony also selected standard components and mainstream processors, which drove down the price the PS4. Microsoft's Xbox One, which is scheduled to ship next week, will cost $499.99 and includes Kinect motion-sensing hardware. The DualShock 4 wireless game controller accompanying PS4 has two new buttons: "Options" for easier navigation of game and console features, and "Share," which makes it easier to share and upload screen shots and video to Facebook and Twitter. The Share button will allow users to broadcast live gameplay sessions through Ustream or Twitter TV, with which Sony has partnered. The new buttons replace the older "Select" and "Start" on the DualShock 3 controller. DualShock 4 also has a multitouch pad that functions as a button. The controller also has a glowing light bar to clearly identify a player, which is an improvement from the predecessor DualShock 3, which had some "obscure little LEDs" to identify players, Mallinson said. Sony switched to x86 architecture -- the same used in most PCs -- as the previous Cell processor in PlayStation 3, though advanced for its time, was complicated and expensive. "Cell was the precursor to today's accelerated processing units, very much a heterogeneous architecture. But unfortunately it was complicated to use," Mallinson said. The PS3 combined an IBM Power-based processor with multiple co-processors and had many distributed memories that created access and synchronization issues for developers. The implementation of networking and an internal hard drive for the first time also created challenges, Mallinson said. "We had to build systems software to make use of all these hardware features. We needed to build in a Web browser, a Blu-ray player with a Java Virtual Machine, media playback, network services, and so all of this caused a complexity and the cost of software and hardware to rise dramatically," Mallinson said. PS4 designers learned valuable lessons from the challenges in making PS3, Mallinson said. As the PS4 design matured, the company studied the rise of mobile gaming and social networking to incorporate related features into the gaming console. The company also made the PS4 capable of handling a wider range of digital content and the background download of patches and updates was made more efficient. It also improved the second-screen functionality feature, where gameplay can be streamed from the console to other devices. "Now for PS4 we've really integrated down to the deep level, supporting second screen not only on the PlayStation Vita [handheld], but also on iOS and Android devices," Mallinson said. Users will also be able to add more friends and they have they option of using their real names instead of avatars.